Re: New i3s (with pics) now what winter wheels/tires? Update - Apparently BMW released a winter tire/wheel package for the i3S. Details are below, however it looks like they're the standard 19" 428 style wheels painted black and the Bridgestone Blizzak LM500 tires. They're basically $600 more due to the black color than the standard i3 winter wheels. The standard i3 winter set aren't 428's, but they're the same size. I just got that set. My dealer said the black set was the same price as the silver set? I’m in Canada so maybe pricing is different. I will post pics once they are on the car. for bmw i3, offset of 19" is 43 for the winter pack. 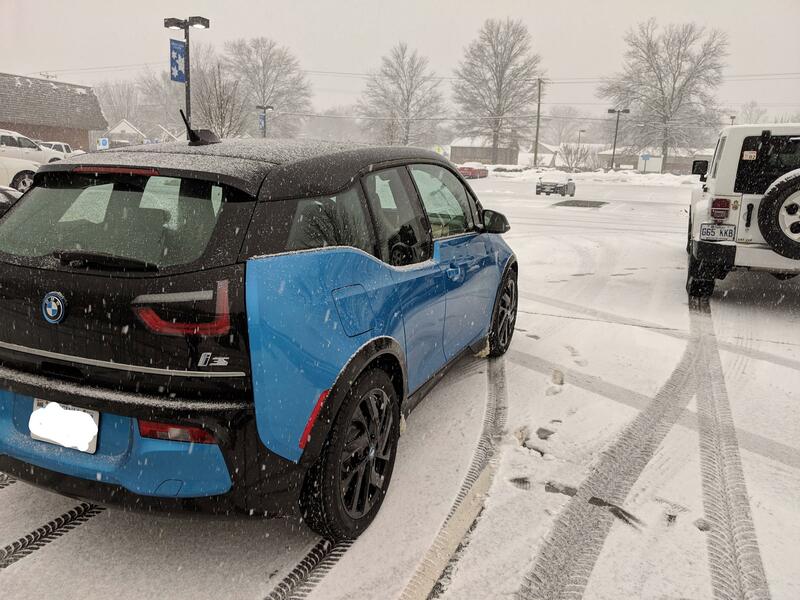 and now, if you take the sport pack on your i3, you have the same config that a i3s, you must take the winter pack from bmw for i3s. if you take the standard i3 19" for your i3s, it cant be good, there is a blog about it. Wow that's good to know about the offset. I wish BMW would tell us this, nothing in the description has any information about it. Here is about 50% more expensive which stinks, Canada has it made! This is interesting . It seems to me that the i3s has gained it's wider track of 40mm front and rear and it's tires are 20mm wider . The inside of the edge of the tires is in the same place . The outside edge is 20mm out . Hence , the center of the wheel/tire must be 10mm further out than the reg i3 . I'm going to suggest that this is achieved solely by engineering the offset of the i3s wheels . Could this lead to suggesting that 10mm spacers would be appropriate to mount the old wheels onto an i3s . An 'Alignment Technician' could perhaps answer that . I have an extra set of winters and I would like to know if I would be able to use them on an i3s (120Ah) . Otherwise I might sell them . tman66 wrote: I just got that set. My dealer said the black set was the same price as the silver set? I’m in Canada so maybe pricing is different. I will post pics once they are on the car. They seem to stick out a bit compared to the 430s? Could just be a visual thing. yes, with spacer 10mm it's ok. But if your want to have the same offset, you must take spacer 15mm. But like the 19" is less large that 20" with 10mm spacer it's enouth. Some calculations suggest that if the centerline of the i3s wheels moves out by 10mm but the wheel is only 1/2" wider (12.7mm) then that would mean that the inner edge of the wheel is actually further out by 3.65mm. Half of 12.7 is 6.35 . The inner half of the wheel is 6.35mm wider but the centerline has moved out by 10mm . Regarding regular i3 wheels for mounting on an i3s , the question would be 'Do we want the centerline or the outside edge of the tire to be in the same place as the original i3s wheels ?' . Spacers would take care of any clearance issues as well . Again , the alignment Tech would answer that . How could it be done without the need to fiddle with alignment specs each time you change winter/summer wheels ? That's for the front . It could be that for the rear , when mounting the 5J on all 4 winters , there's a similar offset for the rear (43reg vs. 39s) but the reg i3 wheels have 8.7mm less backspace and therefore should fit without any clearance issues . Should a 4mm spacer be used on the rears to bring the centerline to the same place or more to bring the outer edge of the tire equal to the original i3s wheel ? More research suggests that for the front , Scrub Radius is dependant on tire diameter and centerline position (directly related to offset) . With tires having similar diameters (699.6/703) keeping the centerline the same would keep the Scrub Radius relatively the same . Again , I am not an alignment Technician ! ! ! ! I wanted to avoid spacers so I finally went with the BMW wheels/tires. They actually ended up being cheaper than all the aftermarket options, and they're also lighter weight. I think this is the best option if you want to get winter tires on your i3s. Just be prepared to wait, it took over 2 months to get mine, and I know there were about 100 other people in the US in the same situation. In case anyone's wondering, they are 19" wheels that are the same size all around, however they are directional so just be careful about mounting. Mounting is also supposed to be done at 101ft lb of torque according to the manual.